Just as this quilt successfully incorporates folk motifs and aesthetic principles from around the world, so can diverse and seemingly contradictory cultures and philosophies, approached with compassion, respect, and love, reveal a beautifully complex, harmonious whole. That is the truth as I see it. Currently on loan to the Holston Valley Unitarian Universalist Church in Gray, Tennessee. The Culture of My Country exhibit, Patchwork& Quilt Expo and International Quilt Festivals (Lyon, France. ; Houston, TX; Chicago, IL) 2006-07. 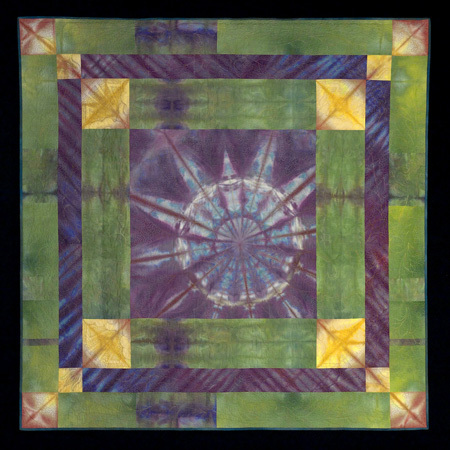 Fiber-reactive dye on cotton, quilted on cotton batting. Quilting designed byCindi Huss, executed by Timna Tarr of Q Tailored Quilts.